MPs, mayors and politicians of the HDP in exile are staging a demonstration in front of the CoE to call attention to the hunger strikes demanding the end of the isolation regime on Abdullah Öcalan. 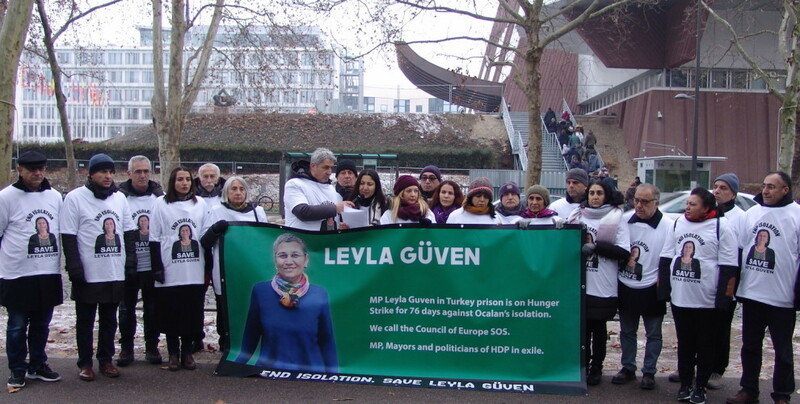 While DTK Co-chair and HDP MP Leyla Güven is on the 76th day and over 250 prisoners on the 38th day of indefinite hunger strike against isolation, solidarity hunger strikes -also indefinite and non-alternate- are continuing in Hewler, Strasbourg, Wales, Toronto and the Hague. As solidarity with the hunger strikes is growing all around the world, dozens of elected representatives of the Peoples’ Democratic Party (HDP) are staging a demonstration in front of the Council of Europe. The demonstration aims to call attention to the hunger strikes inside and outside prisons in protest at the isolation regime imposed upon Kurdish People’s Leader Abdullah Öcalan. HDP members demand and end to the isolation of Öcalan and freedom for Leyla Güven. The press statement on behalf of HDP politicians was read by former HDP MP for Van, Lezgin Botan, and former MP for Şırnak, Leyla Birlik. “We are here today to appeal to the Council of Europe as the politicians who had to leave to Europe due to the fascist practices of the AKP regime, under which thousands of members of our party HDP (Peoples’ Democratic Party) including the co-chairs, parliamentarians and co-mayors have been imprisoned lawlessly. Leyla Güven is since 76 days on hunger strike. 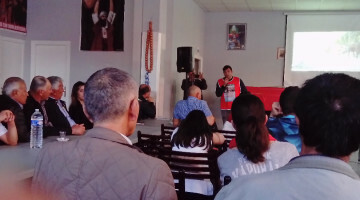 Leyla Güven has been elected from the farthest eastern city of Turkey, Hakkari, by receiving seventy percent of all votes. She was in jail when she was elected. 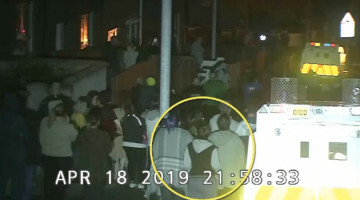 Despite the lack of any convictions she is being kept in prison unlawfully. If she was not in jail, she could participate in the democratization and peace efforts of Turkey from the parliament. However, currently she keeps her struggle for democracy and peace behind the bars, by utilizing her very body. Leyla Güven has only one request: She wants the torture in Imrali Island to come to an end. She wants the lift of total isolation on Abdullah Öcalan who has not seen his lawyers for 7 years and family for 2,5 years. Isolation is a torture and crime against humanity. It is one of the fundaments of the European Convention on Human Rights which is declared by the Council of Europe. CPT, one of the prominent institutions of the Council of Europe, was established to prevent torture and human rights violations in prisons. On the other hand, Abdullah Öcalan is not a regular prisoner. 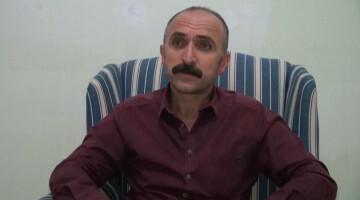 He represents a political will and is highly appraised by the Kurdish people which is supported with a petition of 3,5 million signs saying “Öcalan is my will”. During the time when he was able to see his family and the HDP delegation, there were no killings through armed conflicts. The days Turkey was closest to peace, were peaceful and full of hope. As Leyla Güven is also saying in her letter sent to the protest where tens of thousands of people gathered, “The isolation of Öcalan is a barrier on the way to peace. Mr. Öcalan is an important agency in the construction of peace.”, emphasizing that her action is opening a way towards peace. 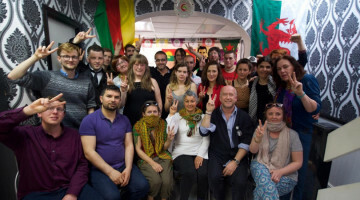 After Leyla Güven started her hunger strike, 239 people in the Turkish prisons, 1 person in Erbil and 1 in London, 14 people in Strasbourg started indefinite hunger strikes. There are also former parliamentarians of HDP who are now in hunger strike. 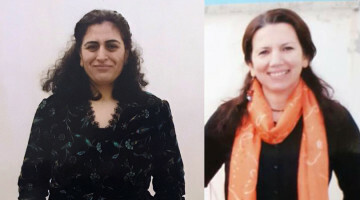 Dilek Öcalan in Strasbourg, Sebahat Tuncel and Selma Irmak in Kandira Prison in Turkey are continuing their hunger strikes. Because of these hunger strikes Öcalan could have a short meeting with his brother after 2,5 years. But this does not mean that the isolation is over. In order to lift the isolation and end the torture, it is required for Öcalan to see his lawyers and family members in legal intervals. If we will not be able stop the hunger strike of Leyla Güven, which leads step by step to her death in its 76th day, we will be responsible for the death of hundreds of people. You, our colleagues, are being invited to recognize and to embrace Leyla Güven and her action. We can keep her alive, together. We can all protect the principles of the Council of Europe and the credibility of its institutions. We can end the lawlessness, isolation and torture in Imrali Island together. Our only expectation from you is to let your institution to do its duty. Let’s embrace Leyla Güven and her righteous demand. Deputies: Ahmet Yıldırım, Besime Konca, Demir Çelik, Faysal Sarıyıldız, Kemal Aktaş, Leyla Birlik, Lezgin Botan, Mehmet Emin Adıyaman, Nursel Aydoğan, Sibel Yiğitalp, Tuğba Hezer Öztürk, . Party executives: Filiz Koçali, Ali Şimşek, Emrullah Bingöl, Hasan Vural, Hayri Ateş, Sabiha Gündüz, İhsan Çelik, Songül Çelik.